With eight minutes left in the second half of Wednesday night’s game, after D.J. Irving had made three straight baskets — each more difficult than the last — and added an assist in short order, the senior guard headed to the bench. For most mid-major teams, the absence of a creator like Irving would offer the opposing defense a breather. For Boston University, however, Irving was replaced by someone just as electric: First-team Patriot League point guard Maurice Watson, Jr. Within 75 seconds, Watson went coast-to-coast to set up Justin Alston for a three-point play, stole the ball from Les Smith on the other end and tossed up an alley-oop that Alston slammed home, one of many exclamation points in a playoff rout. Led by their two dynamic guards, BU thrashed Lafayette 91-54 in its first tournament game in the Patriot League, advancing to Saturday’s semifinal against Army. Watson and Irving, often trading offensive possessions, either scored or assisted 64 of the Terriers’ points, enough to outscore the Leopards alone. After waiting nearly two years, Watson wasted no time making an impact in his first conference tournament game. (BU was ineligible for the America East tournament last season due to its impending departure.) The sophomore hit a short floater, then sank a three-pointer from the wing to give the Terriers their first lead; moments later, he added three points the old-fashioned way. But despite early turnovers, Lafayette’s high-octane offense nearly kept pace, pulling within 17-13 on a Seth Hinrichs trey. Returning from a brief spell on the bench, Watson went coast-to-coast for a layup, then found a trailing Cedric Hankerson for three on a fast break. Moments later, he drained a pull-up jumper on a pick-and-roll and found Travis Robinson for another transition three-pointer. Watson finished with a stat-stuffing 21 points, eight assists, seven rebounds and four steals. “He’s as good as anybody in our league,” Lafayette coach Fran O’Hanlon said. Irving got in on the action late in the second half, crossing over his defender for a pull-up three at the five-minute mark and scoring off the dribble again two minutes later. In the second half, he sent another defender to the floor with a crossover near midcourt, finishing his attack with a dish to Dom Morris for a three-point play. “His message wasn’t even offense. Before the game, D.J. just said, ‘I’m all defense tonight,’ ” Watson said; that may have been so, but Irving finished with 17 points on 8-for-11 shooting. Overshadowed by the Terriers’ 91 points was a very strong defensive performance against one of the league’s best offenses. The Leopards occasionally worked the ball around the perimeter for three-pointers, but they rarely found open shots inside, settling for lots of suboptimal looks and shooting just 36 percent. Meanwhile, the Terriers got 10 steals — turning them into 17 points — as well as several other deflections. BU’s offensive outburst set all sorts of superlatives: the school and Patriot League tournament records for shooting percentage (66 percent); the Patriot League record for most points in a quarterfinal; and the most points for BU in a postseason game since 1989. The Terriers hit 10 threes and scored at least 88 points for the third time in three meetings against the Leopards this season. 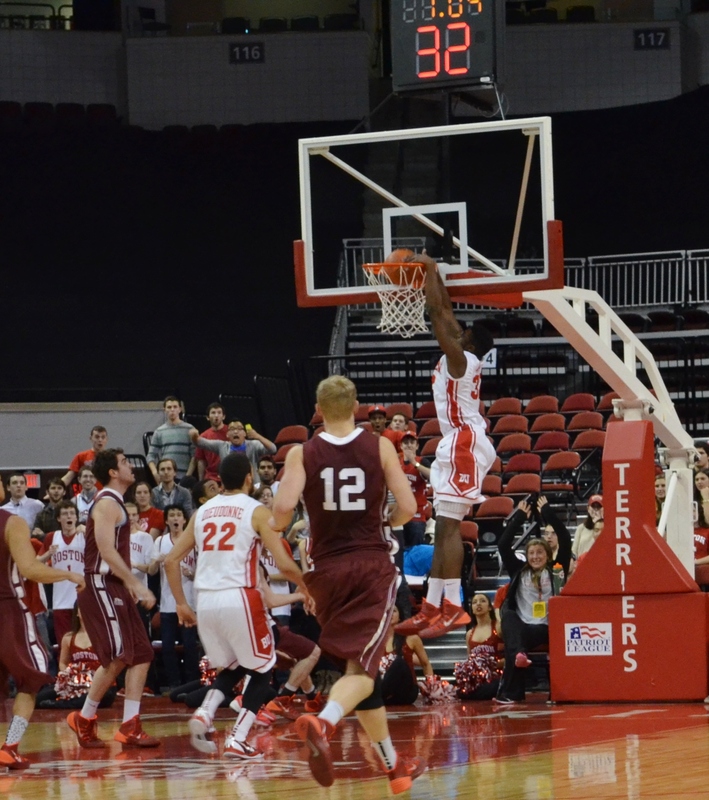 Lafayette is a poor defensive team, but it wasn’t wholly to blame for BU’s banner night. Most players would have difficulty hitting some of Watson’s and especially Irving’s shots in an empty gym, and the Terriers’ shooters — especially 4-for-5 Travis Robinson — came through. BU’s offense was good but rarely great in the regular season, but now that the season rides on every game, will its two spark plugs give the Terriers another gear? This entry was posted in BU, March Madness and tagged Boston University, Boston University basketball, D.J. Irving, Joe Jones, Lafayette, Lafayette basketball, March Madness, Maurice Watson Jr, Patriot League, Patriot League basketball, Patriot League tournament. Bookmark the permalink.